As I accumulated books in my racing history library, I decided to create a bookplate to label them. For me, it was obvious that it would be based on the first Le Mans winner in 1923, a 3-litre Chenard et Walcker Sport racer, driven by André Lagache and René Léonard. In fact, a Chenard et Walcker Sport also took second place. In the following year, Chenard et Walcker took 4th and 5th place. 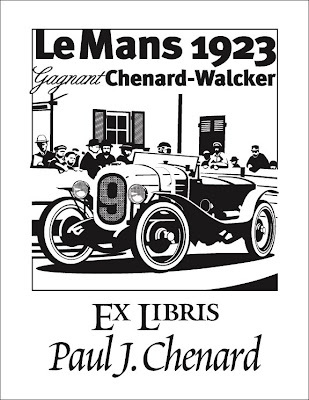 Chenard et Walcker was a French automobile manufacturer that began in 1900, building some sports cars, but later focusing on mostly passenger cars and commercial vans. In 1946, they were taken over by Peugeot, at which point they built only light commercial vans. Though we are of no relation, I love that we share our name. As I get a new (to me) book, I label it with this little piece of history. Is that maison blanche in the background? From the orientation of the roof, and the sharp right turn, I know it's not Maison Blanche, though I'm not exactly sure where it is. they look like being used/worked on,full of paint.